A seafront Victorian building is to be demolished and a 60-room hotel built on the site after plans by Premier Inn were approved by a Devon council. East Devon District Council's planning committee voted 11-1 to approve the proposals for the site of Exmouth's Elizabeth Hall at a meeting on Tuesday. Premier Inn plans to build a three-storey hotel, rising to four storeys in one section. The company said its building would be "fitting of its location". Much of the building dates back to the 1880s. Before the approval, the council, which owned the building, said the Whitbread group-owned firm's plan "provides the best deal for Exmouth in terms of taking on this important site". The company said it was to include art deco aspects in its design which "respects its surroundings". In May, a decision by the council to sell the hall prompted a protest march and a 12,000-signature petition. 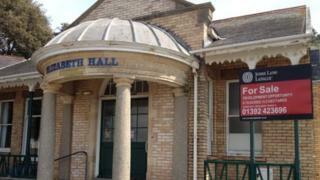 Two other bids, including one from the Friends of Elizabeth Hall to turn it into a community arts and visitor centre, were considered but rejected by the authority.